Exterior and interior shots of half-demolished building. Fairly static, unpopulated scenes, but of interest as revealing its construction, etc. Scenes at a Secondary School Sports Day, with boys' and girls' foot races. Subject in part to processing faults, but the material is in any case repetitive, having been filmed from a single position in each case. Of particular interest is the women's match. Various glimpses of racing in progress, chiefly motorbikes with sidecars. Some solo stunt riding. Match in progress, with stands in background. No close ups. Plenty of action, and good general shots of the stadium, including huge adverts on the roofs. A fairly small crowd of spectators. Static, haunting, agricultural landscapes of bleak beauty, filmed north of the town in February or March. Includes some scenes at Louth Riverhead. After illustrating the traffic problems which necessitated the by-pass, the film shows plant being used to clear and level the site, the laying of drains and road foundations, various concrete structures in progress, the final surfacing, and, from a moving vehicle, a drive along the finished road. At the time, the Laceby by-pass was hailed as exemplifying the latest and best in new road construction; today, the film is also of interest for its numerous incidental details, the vehicles, the hurricane lanterns, even the clothing. Scenes at the station, the gardens, the swimming pool, the roller skating rink, and the beach, including not only donkey rides, but a sand-yacht. The film was made by visitors on a day trip. In effect, an early home-movie. A 7 year old boy wakes up his baby sister on her birthday. She is bathed and dressed; then, out in the garden, he shows her all the presents that have arrived for her. 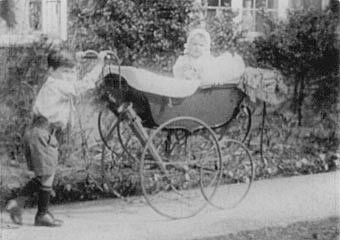 Finally, he wheels her off in her pram. A charming and unusual item, of great social interest. Beach and bathing scenes with much splashing and laughter, after which various family members disport themselves outside their holiday house in Seacroft; Dad makes a turban out of his towel, a small boy dances the Charleston, and a maid in cap and apron stands by. Miscellaneous views of Lincoln, many rather short and disjointed, but including some notable street scenes, a train at a level crossing, Steep Hill, Brayford Pool, the Glory Hole, the Arboretum, and a virtually empty Ermine Street. Filmed by one of the engineers whilst work was in progress. There are scenes of the Boston sub-station, the erection of poles in difficult terrain, unreeling the cable and hoisting it into place, and the installation being inspected. The work is done almost entirely by hand, or by horse-power, most of the route being inaccessible by road. To mark what was said to be the 400th Anniversary of the tulip's introduction to Europe from Turkey, the Turkish Ambassador visits Springfields Show Garden to unveil a statue of the somewhat notional character responsible. The Tulip Parade that year had a Turkish theme, and some of the floats are seen passing the Gardens. King George V and Queen Mary are seen briefly outside the Cathedral, and presenting medals to troops at the Fourth Northern military hospital on Wragby Road which later became Lincoln (Christ's Hospital) School. Of particular interest is the Royal Daimler, specially built to enable the King to enter it without stooping. Street scenes with crowds, a procession of floats, the coronation of the Carnival Queen, and a dance display by children in the park. The Home Guard (1941) are seen both on the parade ground and training in the field. The Battalion Inspection by Lt Gen Ralph Eastwood is also featured, together with a short, humorous recruiting film. 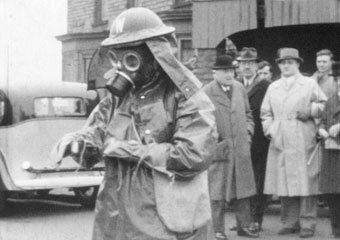 The ARP exercises (1940) include a simulated gas attack, with the decontamination squad in full panoply; the treatment of "casualties" from a "bombed building"; a fire drill, and the rescue of "victims" trapped on an upper floor. A light-hearted, but revealing item of great historical interest. Filmed by a 15 year old boy on his father's farm and depot, and of considerable interest despite its limited technical quality. Steam threshing and horse-drawn ploughing and harrowing are seen; potatoes are planted, harvested, riddled, and loaded onto lorries. Also notable is a circular saw guaranteed to give any Health & Safety official a heart attack. Unedited footage. Numerous horses, including working horses, being led round the ring; the South Wold Hunt; onlookers; horses being led through the street. The history of Lincoln's water supply, which includes various scenes in and near Lincoln, and some items filmed in the Museum. Most notable, however, is the footage of the pumping engines at Elkesley in Nottinghamshire from which the modern supply is drawn.